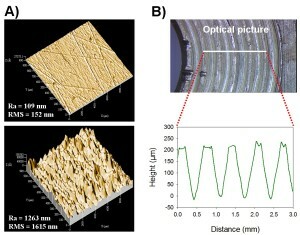 A) Surface morphological images showing parts of a metal surface having different wear (roughness) and B) a profile showing a thread having a pitch of ~0.7 mm and a height of 0.2 mm. Surface Science Western has a mechanical stylus surface profilometer with the stylus comprising a tungsten wire with a diamond tip (radius ~ 2 µm) embedded at its apex. The contact force (usually a couple of milligrams) between the tip and the sample surface is sensed by a capacitance displacement sensor. By maintaining a constant contact force, the feedback system adjusts the position of the tip according to the height of the surface scanned, thus generating a profile of the surface. With a noise level of a couple of nanometers and three height ranges (13, 131 and 1048 µm), our profilometer allows us to measure height differences from 5 nm to 1 mm. The instrument can handle samples as large as 8 inches in diameter and as heavy as 5 lbs. The applications of the instrument cover roughness and waviness estimation and step height measurements. By scanning a series of tracings, one can also obtain a 3D topographic image of the surface, from which any scan lines can be isolated for analysis. A profile obtained on a PTB traceable height standard of 21.9±0.8 nm (TGZ1_PTB), resulting in a step height of 21.7±0.2 nm. A profile obtained on a NIST traceable roughness standard of Ra=0.970±0.025 µm (SRM 2074 S/N 1018), resulting in Ra=0.967 µm. The average roughness estimated over several spots on the standard is Ra=0.966±0.002 µm.